What is the Development Academy? When the Girls' Development Academy kicked-off on Sept. 2, 2017 it represented not only a new elite standard for players on the field, but also for the referees managing the games. Madga Zwierzchowksi, Victoria Catanzaro, Inga Maric and Melissa Jennings officiated the Girls' Academy's first feature match between Sky Blue - PDA (Somerset, N.J.) and FC Virginia (Chantily, Va.). "It's rare that you see an all-female crew on a women's game," said Jennings. "It's important for the girls to see our part in the sport. Women's soccer is developing at a rapid pace, and it's awesome for them." "It's empowering," added Maric. U.S. Soccer announced its plans for the Girls' Academy in 2016, and after more than a year of anticipation, the referees immediately noticed the quality of play on day one. Academy clubs play fewer games in favor of more meaningful contests and the clubs involved in the program's inaugural kickoff showed that the bar has been set at the highest level. While the players were physical, head referee Zwierzchowski said that they played well but within the rules while carrying out their game plans. "You see a really cool level of respect with a lot of these girls because they know they're playing at a higher level," Jennings said. "You see a lot of really cool mannerisms in the kids. They pick themselves up, they say 'I'm sorry.' it's a different level of respect." While it is the referees' responsibility to manage the game, and keep things safe on-the-field, the crew believes that the Academy's commitment to player safety provides the helpful guardrails outside of game action. "They've taken a really good stance on player safety and player development. I think this will be great for the sport and for women in the area," Jennings said. "I think the added training and the added safety aspect, it's going to be pertinent to the level of play that they're going to be able to bring to the sport." Above all, the Girls' Academy presents a new playing field for youth players around the country, while also creating a new platform for referees to advance their careers. All officials are certified and assigned by U.S. Soccer with crews for feature events and showcases selected based on thorough review of their game performances. 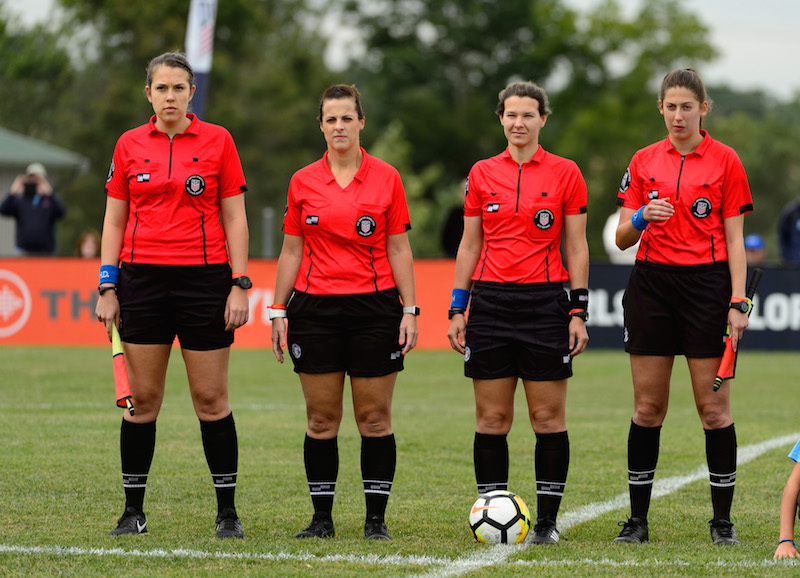 The referees selected for the inaugural feature match understood how special it was to be a part of this enormous step forward for the women's game. "It's kind of monumental for girls' sports. Players like Tobin Heath are coming forward just for the Academy. It puts a lot of clout behind these girls' hopes and dreams that they can become elite and even professional players," Jennings said. "The Development Academy is going down to 12-year-old kids, so these kids have a road for their dreams. There's a map now that they can see the end. That's really cool for those kids. For us, it's equally as cool!" Copyright © 2001 - 2019 U.S. Soccer Development Academy. All Rights Reserved.